Tartare sauce also called tartar sauce is mayo based sauce with gherkins, mustard among other ingredients. It does not have much to do with Tatar cuisine, except for the name. Place in the fridge for at least 30 minutes to allow flavours to develop. Serve on a side with baked or fried breaded / battered fish. Makes enough sauce for 4 – 6 large servings. Tartare sauce taste good with fish but also hard boiled eggs, cold meats or in sandwiches. I like to use Polish gherkins in this recipe as they seem to be sweeter and milder. Sos tatarski is often served during Easter in Poland and there is plenty varieties of this sauce, some of them include horseradish instead of mustard, some of them have addition of pickled mushrooms, capers or even chopped hard boiled eggs. Dill can be omitted if the sauce is not made for fish or seafood, it taste great also without it. I’m adding this to the Inheritance Recipes link-up that we co-host together with Solange of Pebble Soup. 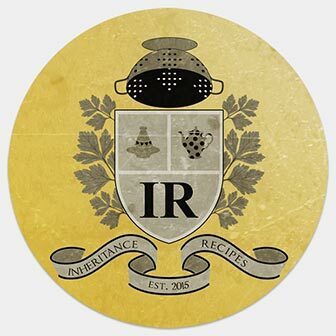 November Inheritance Recipes is hosted by us.